Settling down for a spot of dinner in the same seat where the judge sat when he sent Alan Turing down is a once in a lifetime opportunity. When I was led to my table at Barristers Restaurant & Bar in Knutsford, I knew this was going to be a memorable experience. 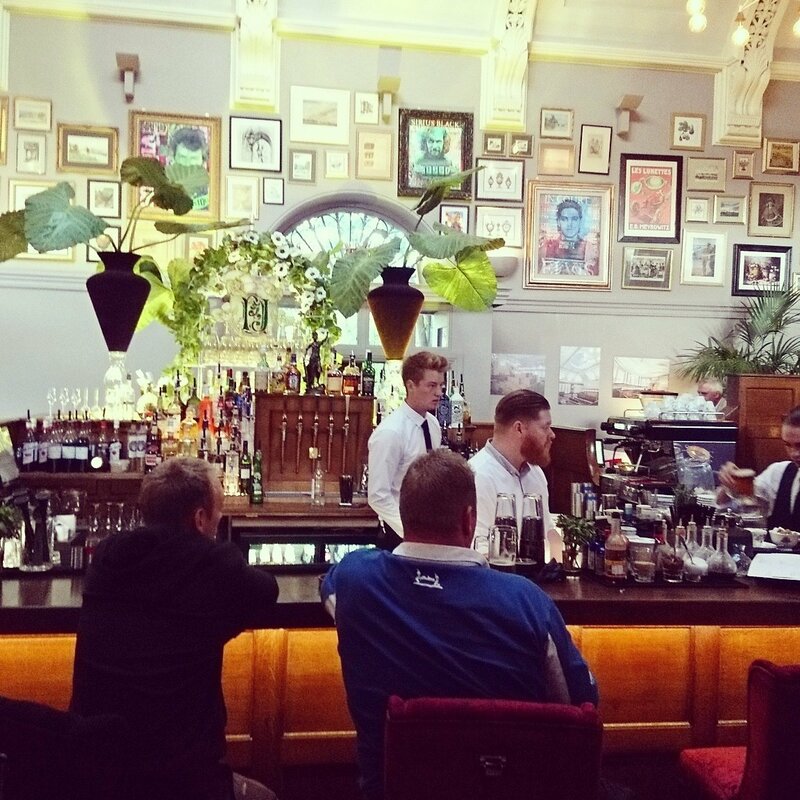 Barristers, set in the renovated and distinctive setting of The Court House Hotel in Knutsford, is a converted courtroom with quirky style and a particularly queer legacy. Stylised mugshots of famous persons (Elvis, Sid, Sinatra, Sirius Black…) in B&W with lashings of neon colour set the tone for this novel eatery. There’s a lime glow from the green glass bottles at the bar and golden crests and coats of arms on the walls – it’s a striking venue with an almost palpable history. But more important that the impressive ambience, I feel, is the impeccable service. We were waited on throughout by the charming Charlie, who regaled us with humorous anecdotes (‘It’s a deconstructed strawberry cheesecake, not a decomposed strawberry cheesecake as I was saying for the first few days!’) and kept the food and drink flowing in a timely fashion. Charlie ensured we had a wonderful evening and for that he deserves full marks. Onto the food, then. The menu crafted by executive chef Steven Tuke (and his team) is wonderful and should be applauded. There was a nice range of dishes on the menu and all of them sounded great – but Charlie was there to give his advice and steer us in our decisions. His recommendations were spot on. 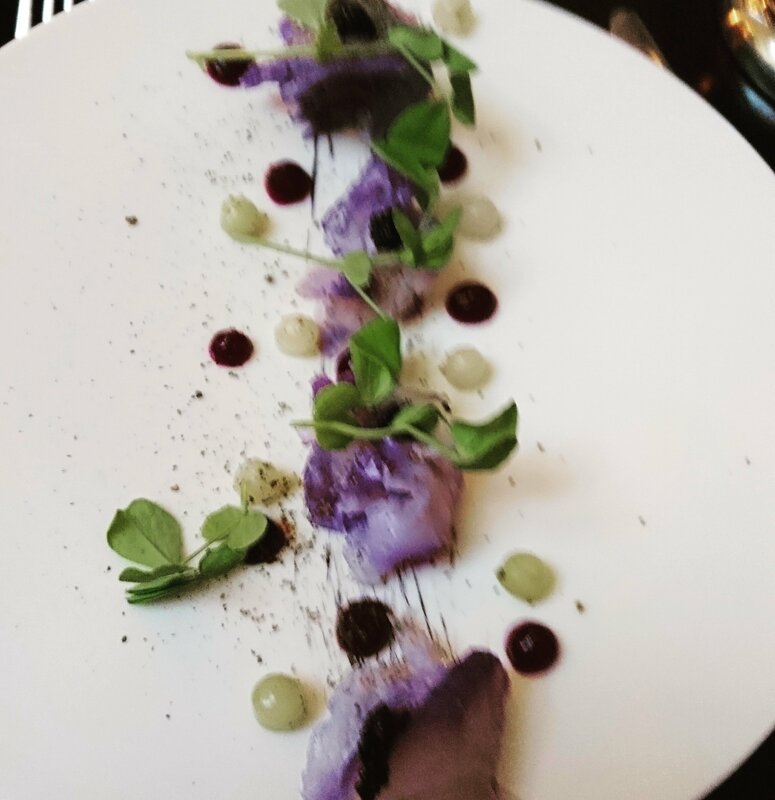 For starter, I had the 12-hour cured cod, red cabbage, ink, cucumber, caviar. It came out looking like parma violets on a plate, which cheered me up no end, and the unique flavours made this an unforgettable dish. My partner, meanwhile, tried the yellow fin tuna, cannellini beans, fennel and tomato press, with salt and pepper squid. This was a creamy, lovely delight, full of texture and gentle flavours. 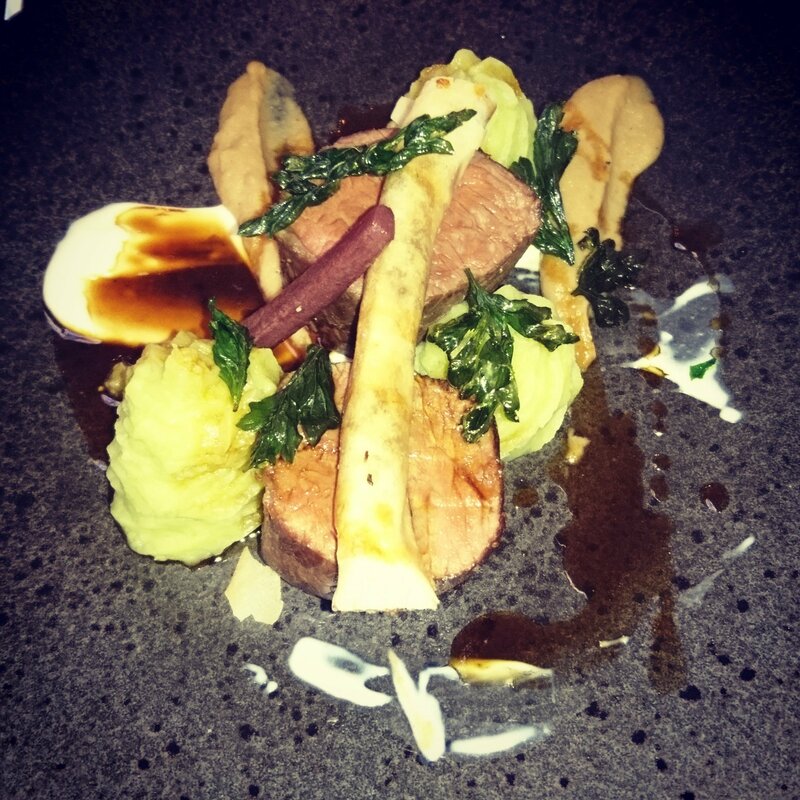 For mains, I had the beef fillet with parsley mash, salsify, caramelised celeriac (to die for! ), Alsace bacon, shin of beef allumette (a ‘matchstick’ or straw of beef) and horseradish. Such an artful combination of flavours, it was probably the best dish of the night. I had this with a side of broccoli, almonds and bearnaise sauce (now my go-to side dish at home! ), which I shared with my partner. 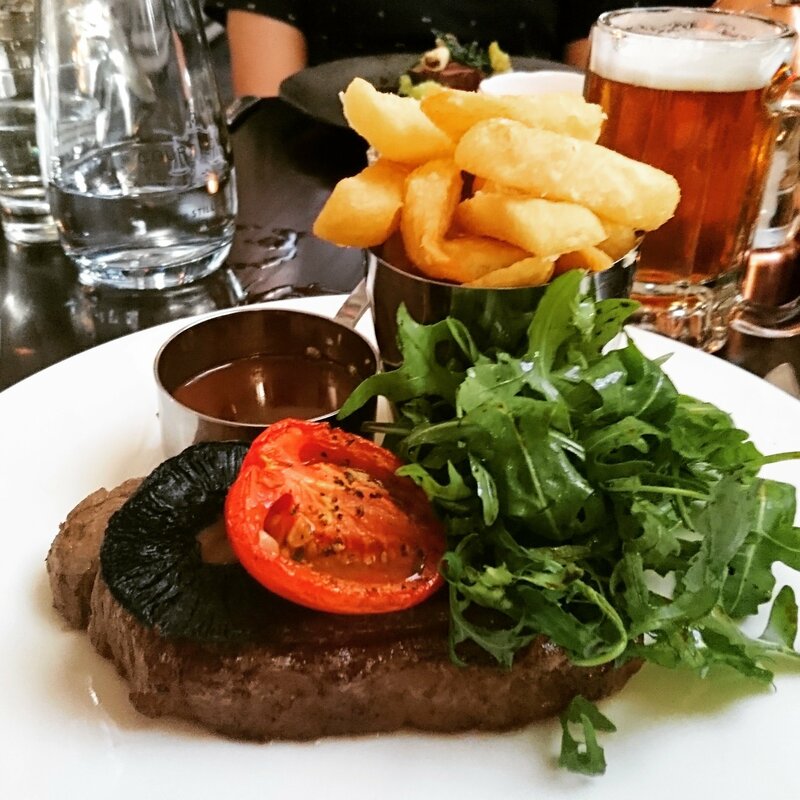 He had the 8-oz sirloin steak, served with parmesan and truffle chips, rocket and balsamic vinegar, grilled Portobello mushroom, dried plum tomato and peppercorn sauce. Frankly, it was one of the best steaks we’ve tried in years, and the parmesan and truffle chips were a fragrant, decadent delight. Come dessert-time, I opted for the tatin with pineapple, caramelised puff pastry, lime cremeux, and coconut marshmallow ice cream. 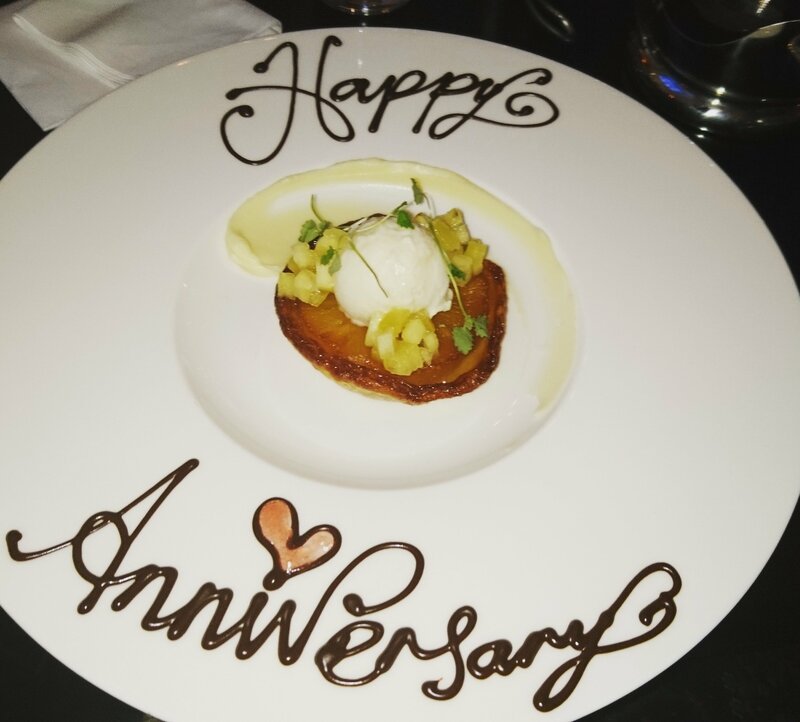 When it arrived, the kitchen gave us a sweet surprise: a lovely marker of our one-year anniversary, which we hadn’t expected at all (thanks to Emily at Perception PR who must have told the restaurant when she booked for us!). 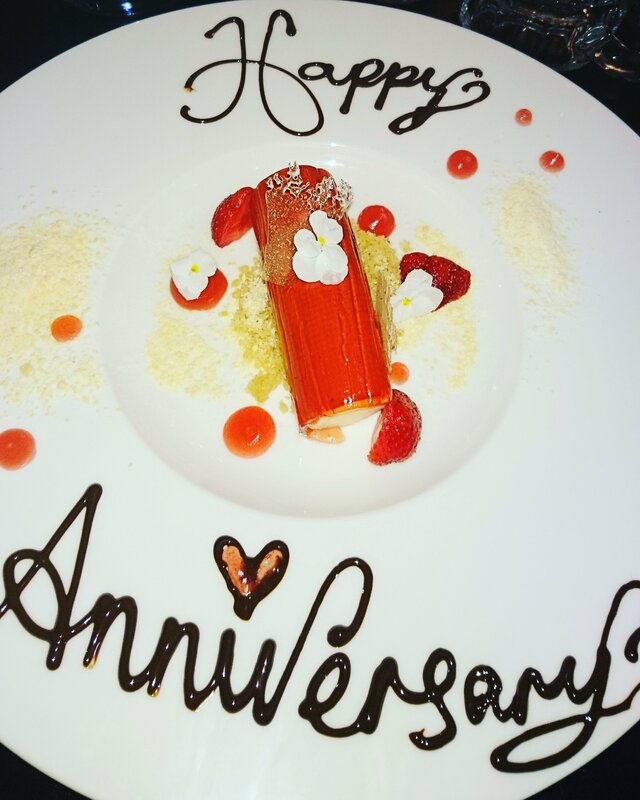 That made our evening, but of course you want to know about the dessert itself. Fear not – it was spectacular. It had the right balance of tropical fruit, soft mallow flavour and rich puff pastry. My partner had the infamous deconstructed strawberry cheesecake: English strawberries, strawberry jelly, sherbet, lavender shortbread. What a treat! Though visually distinct from your average cheesecake, this contained all the flavour you’d expect, expect in a more stimulating-for-the-eye fashion. We were thoroughly impressed. The time seemed to fly by, without awkward waiting, and when we had to leave we had to tear ourselves away. It was especially heartening to see how much the staff appeared to enjoy working in the restaurant. The enthusiasm from management was evident – duty manager Faye was keen to show us every corner of the restaurant and hotel, and laying out the venue’s plans for a champagne terrace in the near future. 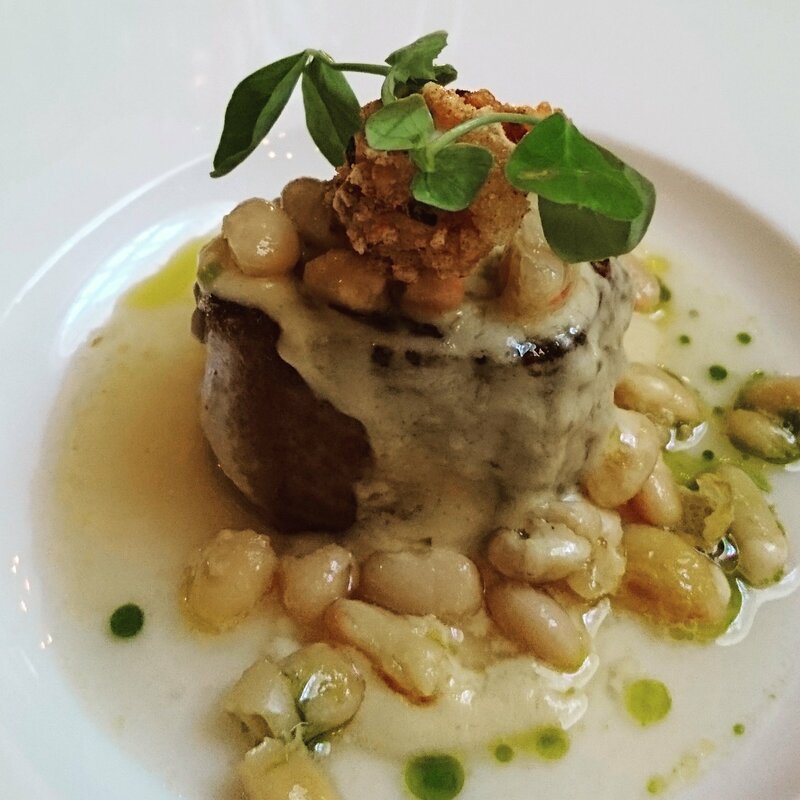 Barristers Restaurant & Bar is a vibrant blend of top-notch service, lavish setting and flawless food. 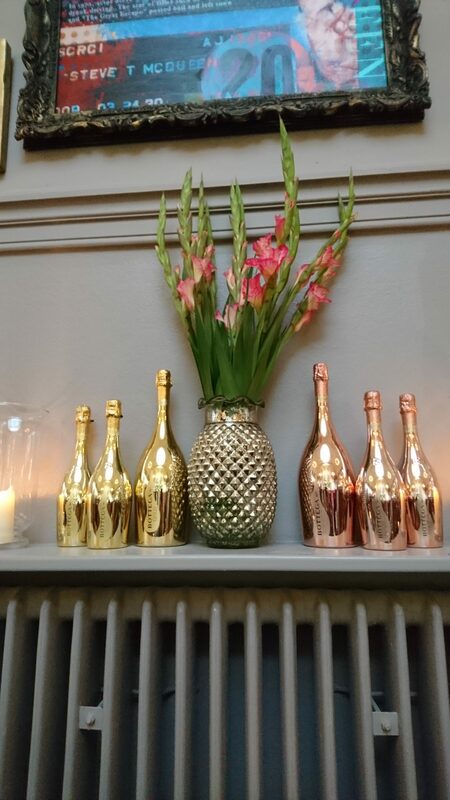 We think it’s going to be the place to eat or enjoy cocktails in Knutsford.